The Union Pacific Railroad strategically evaluated several locations for a new intermodal shipping transfer facility within the Midwest. The sites within the City of Chicago required traffic analysis, site planning and neighborhood urban design alternatives to accommodate transportation connections within the existing street network and to integrate the facility with community development goals. Sonoc Architects provided traffic analysis and site plan diagrams as well as urban design drawings that portray a variety of interrelationships between the intermodal facility and the bordering communities. 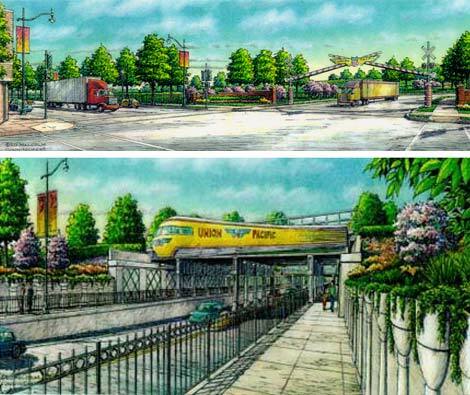 The development goals focused on buffering and blending the "edges"of the intermodal train and truck yards with the surrounding residential neighborhoods, ensuring that transportation routes to and from the shipping facility were easily accessible. Client: Union Pacific Railroad Co.